I have all these opinions bumping around my head, figured I get them out and hopefully help some people in their choice of books. If you have any questions as to where and how I get these books, please don't hesitate to ask. Monica Brisbane loves being a modem girl in the Roaring Twenties. Her job writing a gossip column takes her to all the local speakeasies in Washington D. C. and she loves dancing the night away scoping put new stories for her column. However, her future takes an uncertain turn when the owner of Capitol Chatter passes away, leaving Monica what will happen to her job and her beloved lifestyle. Max Moore might hold the position of editor-in-chief for evangelist Aimee Semple McPherson’s paper, the Bridal Call, but it’s clear that Aimee calls all the shots. So when Max finds out that his great uncle has passed away and left him all his earthly possessions, Max resigns and moves to Washington D.C. to hopefully become a real editor-in-chief. He tries to clean up the scandalous paper and infuse it with his own values, but he’s soon bumping heads with the equally determined Monica Brisbane. With Max’s guidance Monica goes on her most challenging assignment yet, infiltrating and reporting on the Anti-Flirt Society. Reluctant at first, Monica meets and mi goes with the girls but soon begins to doubt the wisdom of her flirtatious ways and when romance starts to blossom between her and Max, Monica must choose between the lifestyle the club chooses or the lifestyle she lived for so long. Will Monica ever change her party and flirtatious lifestyle or will she continue down the path of destruction? Will Max trade everything for Monica or will he be able to convince Monica that there is a life without speakeasies and flirting? Will Max be able to turn the Capitol Chatter into a respectable paper or will he lose the fight against immorality? Can Monica change her ways or is she forever a party girl? Due to my opinion of Allison Pittman’s last novel, I wasn’t expecting much out of this book. I fully expected to struggle through this one like the last and hate it at the end. I didn’t. I actually enjoyed this one. Though my opinion of the enigmatic Aimee Semple McPherson hasn’t budged an inch, I did enjoy the plot line for this and how radically different it was from the previous book in this series. I think Allison Pittman did a much better job with this book than the last. This book had a romance! And a fairly good one at that. The character of Monica is uniquely lovable from the get-go and Max’s serious nature didn’t seem like it would mesh with Monica’s but somehow the author managed to craft a romance that was sweet and lovable. Though it wasn’t the best romance I’ve ever read, it was definitely welcomed compared to the completely confusing disaster of a semi-romance in the last book. Usually I don’t love women crusaders or women evangelist ever in a story, but I loved Alice Reighly and her Anti-Flirt campaign, probably because even though some of her rules are a bit stiff and outrageous, the general idea is one I follow everyday and never thought twice about it. It basically encourages women to not encourage the bad behavior of men by flirting back or making light of it. I think the idea is one every woman should consider to follow. The story of this one was more engaging and felt less like I was watching a horrible tragedy happen right before my eyes, thankfully in that story the accident never happened but it still left a sour mark for me. In this story, there were moments of disappointment or like it might go down the disastrous path again but it pulled out of those situations and was actually a pretty nice story. I would’ve liked to have seen more of a transformation in Monica but part of me felt like this was a different look at how some people come to Christ. This author gave me a much better story with this or and made me very glad that I didn’t throw out all hope with the last book. Though I still don’ love the radical type style that this author chooses, I think I’m becoming more accustomed to it and haven’t given up hope yet of finding an amazing book by her. This book was good but I don’t recommend it for just anyone. Overall, I enjoyed this book a lot more than the previous book by her but I’ still not sold on her writing just yet. 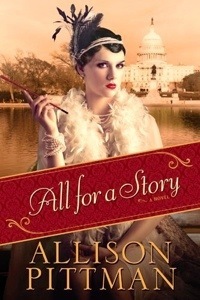 This book is perfect for fans of Allison Pittman or fans of the Roaring Twenties. Keep this book away from your children this one is definitely not recommended for anyone other than adults. I give this book a four out of five. Like My Posts? Follow Me! If you like my posts please post your email below to get a notification when I post a new review.